Does Optimal L3 Forwarding Matter in Data Centers? Every data center network has a mixture of bridging (layer-2 or MAC-based forwarding, aka switching) and routing (layer-3 or IP-based forwarding); the exact mix, the size of L2 domains, and the position of L2/L3 boundary depend heavily on the workload ... and I would really like to understand what works for you in your data center, so please leave as much feedback as you can in the comments. Data centers that run a single scale-out application, be it big data calculations (Hadoop clusters, for example) or web portals. 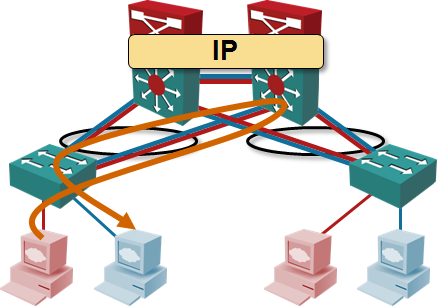 IP addressing and subnets usually don’t matter (unless you use weird tricks that rely on L2), and the L3 forwarding usually starts at the top-of-rack switch. Cloud data centers that use MAC-over-IP encapsulations to implement virtual network segments are also in this category. Fully virtualized data centers need large L2 domain to support VM mobility; VLANs extend across aggregation/core switches (or spine switches if you use Clos fabrics terminology). Data centers with large L2 domains usually use L3 forwarding only in the core switches; these switches have SVI (or RVI, depending on which vendor you’re talking with) VLAN interfaces, and IP addresses configured on VLANs. Most vendors have technologies that combine multi-chassis link aggregation with active-active forwarding (all members of an MLAG cluster share IP address and perform L3 forwarding between connected VLANs). In most cases, you’d use VLANs in a virtualized environment to implement different security zones in an application stack, and deploy firewalls or load balancers between them. If you do all the L3 forwarding with load balancers or firewalls, you don’t need L3 switches, and thus the problem of suboptimal L3 forwarding becomes moot. Do you see suboptimal L3 forwarding as a serious problem? In a previous company, we went with TOR routing, even with a L2 extended everywhere: because of the many vlans used. 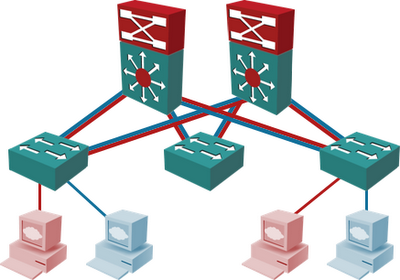 For firewall: iptables on every host, acls and monitoring. You should go with ToR from the beginning, if you can afford it. "Does it Matter?" Not really. In a real cloud L3 hops are largely in appliances and x86 machines. 2 x L3 Core DataCenter Switchs, with 12 VLANs, and L3 between "Core DataCenter Switchs" and "Core Users Switchs"
On Core Users Switchs, we have 95 VLANs. Don't think in L3 on ToR, yet. L3 TOR will typically provide much better flow hashing than glbp/hsrp/vrrp. You get per flow hashing and not per host hashing. It is also easier to go more than 2 wide above your TORs with L3 vs L2. Troubleshooting L3 is much saner than trying to troubleshoot evil protocols like virtual port-channels. Optimal forwarding is nice. I see L3 as orthogonal to firewalls and load balancers, at least at scale. If you are talking about a "datacenter" with a few dozen racks where all the config is hand managed, it probably doesn't matter. If you're network is small enough that a single engineer can hand manage it, stunt networking with vPC and vlans everywhere won't be an issue. Until you try grow it out by an order of magnitude. Then you'll be screwed. I think that my network is small, compared with some large scales datacenter in Google Apple era. My ARP table on Core DataCenter switch has 1100 lines. My ARP table on Core Users switch has 4838 lines. Strictly M1 F1 card speaking - Nexus 7000 switches require an M1 card to route traffic. Each M1 card can route 80Gb throughput. If i have one M1 card and 9 F1 cards and all servers are on their own subnet (hello VSheild Edge or VSG) then they need to get routed. Routing over-subscription can reach 1 to 36. M2/F2 series run into same issues with lower OSR. If you want your 7K pair to never be oversubscribed then you need to plan around routing. That's why I try to design L2 domains that will rarely route to other L2 domains in a data center if i can prevent it. If you want your 7k pair to never be oversubscribed, only use M108s. Done. I am spoiled in that I don't need to support bridging a broadcast domain across multiple racks. If I need multiple security domains, I prefer having different physical routers. It is way easier to scale wide with simple blocks than trying to support stunt networking. If you can connect all your racks to a single pair of routers, it probably isn't a big deal. This is an interesting discussion that we have thought about recently when we decided to build a few data centers to consolidate many DCs handling 15K apps. VM and HP's equivalent were to support 80% of these apps. 2 DCs are paired by DWDM and short distances to be able to accommodate capacities in excess of 100 Gbps and low latencies for whatever FC or Ethernet based replications people want to do. At each DC we have a lan core of 2xN7Ks, end of row of 2xN5Ks for every row, and the N2Ks FECs for the top of rack which connect to blade/chassis based switches. So, many port channels and many trunks everywhere. Naturally, the biggest point of disagreement between the server/application teams and the network team was the border between L2 and L3. Ultimately, we brought L2 back to the lan core. To the other DC, rest of the Wan, load balancing infrastructure, or services on the other side of firewalls, we route at L3. Suboptimal forwarding performance, within the L2/L3 switched lan environment, is less a concern to us, than the performance limitations we have when traversing our firewalls, IPSs, or Wan. Even when packets or frames need to come back to the core, we are probably looking microseconds of additional delay versus milliseconds of delay. Another important consideration for us, is routing into and out of the pair of data centers requiring symmetry for wan optimization and security. This forced a certain level of suboptimal routing into the design. Another reader mentioned simplicity of design. In my opinion, this is even more critical than sub-optimal routing to the performance of a data center within the data center. If only high level engineers can troubleshoot and resolve issues, due to the complexities of the data center, then the time to resolution increases substantially as there are generally fewer of these engineers around. The only caveat is that the uplinks and hardware has the capacity to be able to forward the traffic. It seems people go with large L2 domain because vMotion requires the same VLAN domain for moved to host and moved from host. Is there something fundamental that prevents vMotion to work across different but reachable subnets? Yeah, I suppose you can do vMotion across different subnets if you can make DNS act in milli-second level and figure out a way to flush client DNS entry also in milli-seconds. Even that won't work, TCP connection will break when IP address changes. There's a mechanism that works - host routes. There's not much difference between having /32 prefix in IP table and MAC address in MAC table ... apart from the fact that one of them is predictable (based on routing protocols) and the other is guesswork (based on traffic gleaning). However, routing protocols require actual configuration, some knowledge, and might take a few seconds to converge. I don't understand your argument, how host route is related to vMotion at all? could you please elaborate? The problem with vMotion between subnets is that the IP changes (moving from one /24 to another, your IP *must* change in order for the routed infrastructure to find the new location). However, if the IP of the VM guest is announced to the network (maybe by the hypervisor) as a /32, then the guest can migrate to virtually anywhere on the network and the new hypervisor simply announces the /32, the old one stops announcing, and the guest has been migrated (ok, so it's maybe not all that "simple" but it's possible). There's a few protocols that don't like a host to switch IPs and subnets. Namely all of them. Remember vmotion moves a live running server between hosts. I hate to give this answer, but: It depends. Given the typical tools of VLAN and VRF, many datacenters would find that VRF support is lacking and/or burdensome to support in access and aggregation tiers. So VLANs make more sense, bridging at the access/agg with routing happening in the "core" or WAN edge. Of course, this also gives a larger broadcast domain and might facilitate mobility, plug and play behaviors, etc. As to traffic patterns: If we're using VRFs for the routing edge, then maybe it doesn't matter - if the VRFs are supporting different VPNs then inter-VLAN traffic isn't likely anyway. On the other hand, if each VRF is routing (e.g. locally) between multiple VLANs then you get a traffic trombone. It's not very efficient of course, in terms of capacity etc, but even a "traffic trombone" is possibly a good tradeoff in terms of centralizing the VRF capability and configuration. And as you point out, we may have this traffic pattern anyway because of e.g. 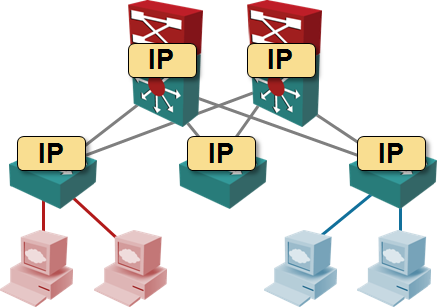 the location of the security edge (firewall) or load-balancer. In other environments, VRF support may not be necessary for L3, e.g. because we're attaching everything to "the Internet" or some other common network. In that case, it might make more sense to route in the access and/or aggregation layer. Plain L3 routing is more likely to be supported in various equipment, and it's somewhat easier to manage. And we can always run both L2 and L3 throughout the datacenter - L3 on the access node for routing to the Internet and L2 for carrying traffic to centralized VRF PEs, or something like that. You can probably imagine other ways to combine these; the point is that each design will be judged based on the purpose / goal of the datacenter, so there's probably no "one size fits all" answer here. Goodbye Echo, I’ll miss you!